9/26/2011 – In his report on the competition, which was won by 19-year-old Kacper Piorun, the second-placed solver, GM Dr John Nunn, presented a selection of problems which the competitors had to face. Today he presents the solutions, in the unique explanatory style that has made his many chess books so popular. Studying his notes allows you to delve into the magical world of chess problems. If it were Black to move, then White would be able to mate at once. For example, 1...f3 allows 2 g4#, a bishop move is met by 2 Re5#, and a move by one of the pieces surrounding the white queen allows the queen to mate at b1, e4 or h7. So Black is already in zugzwang and White only needs a waiting move to solve the problem. However, that would be too simple (it is a world championship, after all). A quick check shows that there is no viable waiting move, for example 1 Bg7? and 1 Re7? block the queen’s path to h7. The line-up of pawns on Black’s second rank suggests that his defence to White’s threat will be to move one of the pawns, threatening a check on the second move. Therefore, it’s reasonable to see if there are any mates prepared for these pawn moves. After 1...c5, White has the attractive 2 Rd3+ exd3 3 e4#, which must surely be one of the variations. There are also mates prepared for 1...dxe6 (by 2 Nf7 followed by Nf6#) and 1...d6 (by 2 Bg7 followed by 3 Ne3#, the choice of square for the bishop being determined by the need to prevent a black check). Remember that Black moves first! This tough problem defeated most of the competitors in the World Solving Championship. In a helpmate, spotting the mating position is usually the key step, working out how to get there is usually less difficult. The trouble here is that the mating position is not at all obvious, since there are many possibilities. It’s reasonable to suppose that the white king will not be involved, since the composer has made a big effort to keep it out with a wall of black pawns. Let’s start with the simplest assumption, that the black king is mated on its current square, e6. One possible mating position has the white knight on f7 and bishop on c4, with d7, e7, f6 and f5 blocked by black pieces. Indeed, by playing ...Bd7, ...Re7 and ...Qd4-f6 this can be arranged with one black move left over. White’s knight can reach f7 in three moves, so White also has one spare move. Unfortunately, the spare moves (one white and one black) are not enough to arrange this mate, as two black pieces are controlling c4 and cannot be removed in time. However, even this negative result is helpful, as we now know why the knight on b2 and rook on c2 are on the board, to prevent an unintended solution. This suggests that perhaps these pieces won’t play an active role in the solution. It’s not an absolute guarantee, since a clever composer will often use pieces for multiple purposes, but at any rate we shouldn’t be surprised if the knight and rook don’t take part in the actual mates. OK, so how about reversing the direction of the mate and having the white knight on d5 and bishop on g8, with d7, d6, e5 and f5 blocked? Black’s pieces can easily block these squares in five moves and the white knight takes only one move to reach d5, but there’s a problem getting the bishop to g8. The mating move must be Bh7-g8# and the only way the bishop can reach g8 in four moves is to take the f5-pawn, which destroys the mate. So again we are out of luck. It seems that mating the king on e6 doesn’t work, so how about other nearby squares? Assuming the general mating pattern is correct, d5 is tempting because one square is already blocked by the c4-pawn and the queen can block d4 or c5 in one move. So let’s suppose that White’s knight is on e4 and bishop on b7. This can be arranged in four moves, leaving one spare. Black’s moves can be ...Kd5, ...Qd4, ...Re7-e5 and ...Be6 in some order. This looks promising, so how about the actual order of moves? ...Kd5 isn’t possible yet, so Black’s first move must be ...Re7 or ...Qd4. The white knight doesn’t have many routes to reach e4 without checking the black king, and Nd3-f2 (or c5)-e4 looks much the most promising. At first it seems that several move-orders should be possible, so let’s try one and see what the problem is. So let’s play 1 Qd4 (Black’s moves are written first in helpmate solutions) Nd3 2 Kd5 Nf2 3 Re7 Ne4 4 Re5 and now we can see a problem. White needs a pass move, to be followed by Black’s ...Be6, but there is no pass move. A knight cannot lose a move, and the white king has no moves, so the pass move must be supplied by the bishop. This means that Bc8 must be the pass move, but of course White must not take the bishop, as this would ruin the mate. This explains why the move-order is unique, since Black must get his bishop to e6 as soon as possible to allow the pass move Bc8 by White. The bishop can only move to e6 after the rook has moved to e5, so the solution is 1 Re7 Nd3 2 Kd5 Nc5 (f2 is still blocked, so the knight must go this way) 3 Re5 Ne4 4 Be6 Bc8 5 Qd4 Bb7#. Where does one start in a position like this? The first point to note is that the a3-rook is covering a mate on g3 and the g1-bishop is covering a mate on c5. These lines cross at e3 and at first sight the solution might appear to involve a white piece landing on e3. However, the only piece that can move there is the bishop, but after Be3 Black can play ...Kxe3. Let’s play a game of what if. What if Black was somehow forced to play his rook or bishop to e3? It’s certainly possible to imagine this could happen, since both moves give the black king a flight at f4, and this might be the only way to defeat White’s threat. Imagine it’s Black to move and he plays 1...Be3. Can White mate then? The obvious continuation is 2 Nxg3+ Kf4 3 Nh5+ Ke4. If this were to be a variation, White would have to mate in three more moves. A quick check shows that this can be achieved by an attractive double sacrifice: 4 Bf3+! (thanks to the black bishop on e3, Black cannot take this with his rook) 4...Nxf3 (4...gxf3 is the same) 5 Nc5+! Bxc5 6 Ng3#. So now what if 1...Re3? Then 2 Nc5+ Kf4 leads to the analogous line 3 Rd4+! exd4 (3... e4 4 Nd3#) 4 Nd3+ Ke4 5 Nxg3+! Rxg3 6 Nc5#. These two lines must surely be the main point of the problem, but there remains the question of the key and threat. White doesn’t actually have many pieces which aren’t occupied with important duties, and although 1 Bd1 threatens mate on c2, the reply 1...Nxg2 destroys any hope of mate. The only real prospect for a threat is to retreat the rook to d7 or d8, so as to make way for a check on d6. It looks as though 1 Rd8 is the more plausible move, threatening 2 Nd6+ Kd4 3 Nxf5+ Kc5 4 Rc8+ and mate next move. However, after 1...Nb6 or 1...Nc7 the threat is defeated, and then there is no mate in the required number of moves. The line-up of black pieces on the first rank suggests that White will mate himself by forcing the black knight to move, discovering mate from the rook. The only plausible way to compel the knight to move is to play bxc3+, but at the moment this doesn’t work because the white rook can interpose on b1. Therefore one might consider a move such as 1 Ra6, threatening 2 bxc3+, but the problem is that Black can reply 1...Bxc5, so as to recapture with the king on c3. Still, the line-up of the bishop on c5 and the king on g1 suggests that in this case a different type of mate might be possible. 2 Ng4+ Kc4 3 Nxe3+ is certainly an idea, but unfortunately Black need not take the knight but can simply move his king to the b-file. That is a consequence of 1 Ra6?, and a quick check shows that the 2 Ng4+ and 3 Nxe3+ line is already prepared for 1...Bxc5, only provided the white rook stays on the b-file. But without moving this rook, how does White create a threat? At this point an imaginative step is necessary. How about if Black is in zugzwang after the key? This idea is reinforced if one notices that 1...Na6/c6 can be met by 2 Rb4+ Nxb4 3 bxc3+ Nxc3#. The key must cope with 1...cxb2, for which there is currently no obvious reply, and moves of the bishop to squares other than c5. Now the obligatory detour into the world of astronomy. The following images were taken with telescopes at GRAS (Global-Rent-a-Scope), an organisation which offers top-quality telescopes for hire at various locations around the world. You can click on them to see larger versions. 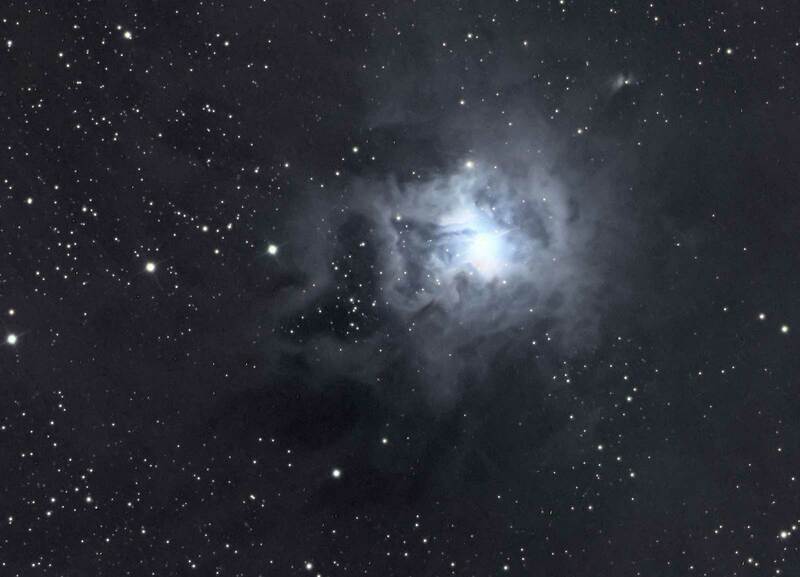 The Iris Nebula lies about 1,300 light-years away in the constellation of Cepheus. It consists of a cloud of dust and gas illuminated from within by a bright star. It appears blue because the dust in the cloud, which is about six light-years across, scatters blue light better than other wavelengths (a similar process creates the blue sky on Earth). 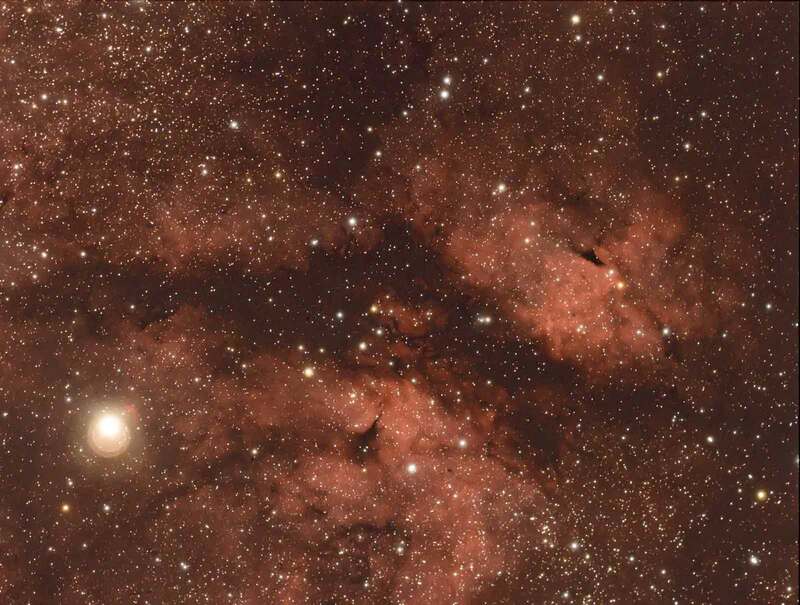 This image shows part of the Gamma Cygni nebula, which is a huge area of nebulosity in the direction of the bright star Gamma Cygni (also known as Sadr). Gamma Cygni, the bright star to lower left in this image, is only 1,500 light-years away, and so cannot be physically connected to the nebula, which lies at twice the distance. The nebula is a huge gas cloud and it is emitting the pinkish light typical of excited hydrogen gas. Please note that there will be an astronomy presentation by Dr John Nunn and Dr Christian Sasse during the London Chess Classic in December. We hope that Vishy Anand, who is also a avid user of GRAS, will look in and show us some of the images he has recorded with Dr Sasse's remote telescopes.